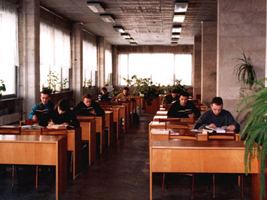 Main Faculties: Cybernetics; Computing Machines and Systems; Radioengineering system; Electronics; International Faculty of Informatics; Economy and Management. Administration and informatics in technical systems; Control systems in satellites; Control and automation systems in aviation; Computer control of moving objects; Applied mathematics; Informatisation of state administration; Automatic processing systems of information and control; Information technologies in mass media; Banking information technologies and systems; Telecommunication networks and systems; Intellectual information technologies, systems, complexes and media; Management of information resources; Biotechnological and medical devices and systems; Computer systems and networks; Design and technology of computers; Radioengineering; Satellite telecommunication systems; Design and technologies of Radioelectronic means; Standardization and certification of electronic devices; Physical methods and devices of Introscopy; Physics and technology of materials and components of electronic techniques; Microelectronics and transistors; Optical instruments and systems; Optical communication lines; Optoelectronic systems of information processing; Electronic instruments and devices; Semiconductor lasers; Industrial electronics. Postgraduate education is carried out in 20 specializations, in the following main directions: Informatics; Computers; Systems of computer design; Telecommunication networks and systems; Control and processing of information in Biotechnological and medical systems; Intelligent technologies and systems of artificial intellect; Radioengineering devices and systems including microwave techniques; Control of flying and space objects; Radio-physics; Physics; Superconductivity; Electronics; Quantum electronics and microelectronics; Optical computer systems; Laser techniques; Materials of radioelectronics; Ergonomics. The education term in MIREA is 5 years and 6 months. Application of documents for admission is until August 30-th. 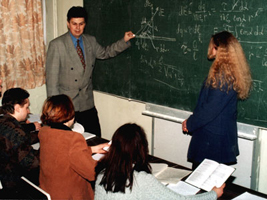 The following subjects can be tuited in English: Higher algebra; Calculus; Theory of probability; Mathematical statistics; Physics of Dielectrics; Materials for electronics; Electrical measurements; Automatization of scientific investigation; Biochemistry. Mathematics; Physics, Russian language, Programming languages. MIREA takes part in the European program " Tempus-Tacis ", supports business and research contacts with a number of institutions from Germany, France, South Korea. MIREA professors give lectures in more than 30 universities of Europe and America. I am from India. I am interested in pursuing my Research (PhD) from this university in the filed of Radar/communication. Can anybody let me know the process.